The collaborative efforts of more than 120 individual contributors, including members of the U.S. Department of Commerce’s National Institute of Standards and Technology (NIST), the American Iron and Steel Institute (AISI), the Association for Iron & Steel Technology (AIST), the Steel Manufacturing Simulation and Visualization Consortium (SMSVC), and CIVS, culminated in the August 22, 2018 official release and dissemination of the AMTech Program–commissioned report: Technology Roadmap for Advanced Simulation and Visualization for Steel Optimization. Initiated in 2013, the AMTech competitive grants program focused on establishing new or strengthening existing industry-driven consortia addressing challenges that limit the growth of advanced manufacturing in the U.S. A 2014 AMTech Planning Grant was instrumental in the formation and launch of the SMSVC in January 2016 and in the development of the Technology Roadmap—an instrument designed to be both an informative guide to applications of simulation and visualization technologies within the steel industry and an encouragement to future research and development efforts. The ultimate target of this project is to ensure a leadership role of the U.S. steel manufacturing in the global market by developing innovative technical solutions using advanced simulation and visualization technologies through an industrial-led consortium for 1) increasing energy efficiency and lowering costs in existing processes throughout the steel manufacturing value chain; 2) evaluating the energy efficiency and cost-effectiveness of new and long-term processes; 3) narrowing the skills gap through improved workforce training; and 4) disseminating advanced technologies throughout the U.S. steel industry including small and medium-sized companies. 1)	To establish a new industry-led steel manufacturing consortium that will focus on supporting the development of advanced simulation and visualization technologies to address major technological issues and related barriers that inhibit the growth of advanced manufacturing in the steel industry. 2)	To develop an industry-led steel manufacturing Technology Roadmap that will identify and prioritize research projects for the application of simulation and visualization that will advance steel manufacturing competitiveness across the steel industry value chain. Both objectives have been accomplished, and both “mechanisms of influence” continue to perform the following: (1) advance American steel manufacturing competitiveness and positively affect operations and activities (safety, energy efficiency, product quality, process optimization, productivity, etc. ); (2) promote the benefits and use of advanced technologies—such as modeling, simulation, and visualization—in steelmaking; and (3) prioritize research projects for ongoing improvement and sustainability of manufacturing enterprises across and throughout the steel value chain. 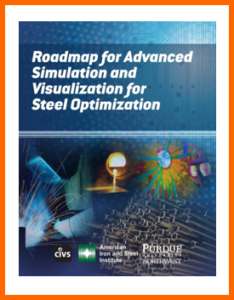 Through established infrastructure, the Steel Manufacturing Simulation and Visualization Consortium continues to delineate and perform collaborative research, the results of which have already yielded significant economic/operational benefits to steelmakers (many of which are chronicled in the Technology Roadmap), and through publication in peer-reviewed journals and presentation at industry conferences continue to guide investigations into materials and process advancement. For steelmakers and associated manufacturers/suppliers both within and beyond the Consortium, the now-available Technology Roadmap can serve as a guide to current, actual benefits and uses of advanced technology in steelmaking, and to future, exploratory possible benefits and uses—and as an incentive to participation in research and development efforts. To download a copy of the Technology Roadmap, click on the icon (graphic) at page top.